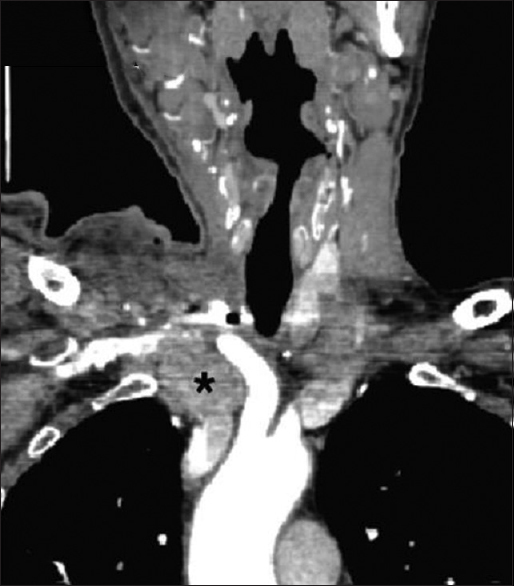 A 66-year-old gentleman with known coronary artery disease presented with neck mass of 2 years. He complained of occasional dysphagia. A large 6 cm × 5 cm firm, fixed mass was palpable over the right side of the neck. Ultrasound showed a hypoechoic nodule with large chunks of macro-calcifications suspicious of medullary thyroid carcinoma. Core biopsy from the neck mass was reported as a spindle epithelial tumor with thymus-like differentiation (SETTLE). A positron emission tomography–computed tomography (CT) scan showed a fluorodeoxyglucose (FDG)-avid large soft-tissue density mass extending from right level II to the supraclavicular fossa and superior mediastinum. Areas of necrosis and foci of calcification were seen within the mass [Figure 1]a and [Figure 1]b. The mass was seen to infiltrate the right lobe of the thyroid gland and displace the hyoid, the cricoid, and the trachea. It seemed to encase the right sternoclavicular joint, right brachiocephalic vessels, and right common carotid artery (CCA). FDG uptake was also noted in a tumor thrombus along the right internal jugular vein (IJV) and superior vena cava. There was no evidence of distant metastasis. Preoperative blood testing reports showed the values of serum thyroid-stimulating hormone, calcium, carcinoembryonic antigen and calcitonin, among others were within normal limits. A T-shaped incision was taken in the neck, flaps were raised, and the tumor exposed [Figure 2]a. The tumor mass appeared to arise from the right lobe of the thyroid gland and was infiltrating the adjacent blood vessels and overlying strap muscles. The left lobe of the thyroid gland appeared normal in size with no palpable nodules and hence preserved. The mass excision involved sacrificing the IJV, vagus nerve, and cervical sympathetic chain. The external jugular vein as well as the IJV was noted to have tumor thrombus within the lumen. The tumor was encasing the CCA and subclavian vein and was shaved off leaving some tumor remnant. The medial one-third of the clavicle was also excised as part of the specimen [Figure 2]b. In view of his coronary artery disease, he also underwent a coronary artery bypass grafting. The wounds were then closed primarily over suction drains. The patient was discharged after a hospital stay of 18 days. The histopathology was consistent with SETTLE tumor of the thyroid. Grossly, the tumor was noted to be fleshy, nodular, soft to firm, and involving the entire specimen [Figure 3]a. At the periphery thyroid-like gray-brown tissue was identified. Under low power, tumor cells had oval elongated nucleus, inconspicuous nucleoli, and ill-defined cytoplasmic borders. These cells were fairly uniform, bland, and lacked atypia. Admixed were a few glandular areas lined by low cuboidal epithelium with central eosinophilic material and a few mature lymphocytes. Multiple foci of calcification were also seen [Figure 3]b. Under high power, smears were noted to be highly cellular showing cohesive clusters of spindle cells. Cells had a uniform oval nucleus and scanty to moderate pink cytoplasm. Mitotic figures were very rare. Focally, these cells appeared to have vague follicular patterns [Figure 3]c. Immunohistochemical staining was performed using the VENTANA automated immunostainer with a labeled streptavidin-biotin-peroxidase detection system. Tumor cells were positive for pan-cytokeratin and high molecular weight CK. They were negative for synaptophysin and thyroglobulin, thus excluding primary tumors of the thyroid. Spindle cells were also negative for CD5 and CD20 which are usually expressed by thymic carcinomas and thymomas, respectively. They were negative for SMA, CD99, EMA, TdT, and CD117. Although the resection was incomplete, no adjuvant therapy was advised given his comorbidities and the fact that SETTLE is known to have a relatively indolent course. At 6 months posttreatment, the patient presented for follow-up. A CT scan was done which showed residual disease measuring about 3.9 cm × 2.6 cm in the neck but no distant metastasis [Figure 4]. SETTLE was first described by Chan and Rosai in 1991. It is commonly diagnosed in young adults and children. It is a part of a spectrum of tumors which arise from the thymus, the branchial pouches, or its remnants. SETTLE tumors represent the malignant end of the spectrum. The origin of these tumors is uncertain with possibilities of origin from thymic remnants or from primitive thyroid cells. In English literature, there have been 42 cases reported so far, with the oldest patient being 59 years of age. This patient at 66 years of age would, therefore, become the oldest reported case of SETTLE. Considering the rare presentation of this tumor in the older age group, it is important to rule out other differential diagnoses of spindle cell tumors such as medullary thyroid carcinoma and sarcomatoid anaplastic carcinoma among others. We chose to operate upon this patient in spite of his age and extension of disease in view of the impending compression on adjacent vital structures. The reported cases have had varied modalities of adjuvant treatment, but primary modality remains to be surgery. Patients with SETTLE neoplasm need to be kept on long-term follow-up due to their propensity for distant metastases at a much later date with a mean of 11.4 years after diagnosis in the cases studied so far. Chan JK, Rosai J. Tumors of the neck showing thymic or related branchial pouch differentiation: A unifying concept. Hum Pathol 1991;22:349-67. Cheuk W, Jacobson AA, Chan JK. Spindle epithelial tumor with thymus-like differentiation (SETTLE): A distinctive malignant thyroid neoplasm with significant metastatic potential. Mod Pathol 2000;13:1150-5. Ippolito S, Bellevicine C, Arpaia D, Peirce C, Ciancia G, Vigliar E, et al. Spindle epithelial tumor with thymus-like differentiation (SETTLE): Clinical-pathological features, differential pathological diagnosis and therapy. Endocrine 2016;51:402-12. Recondo G Jr., Busaidy N, Erasmus J, Williams MD, Johnson FM. 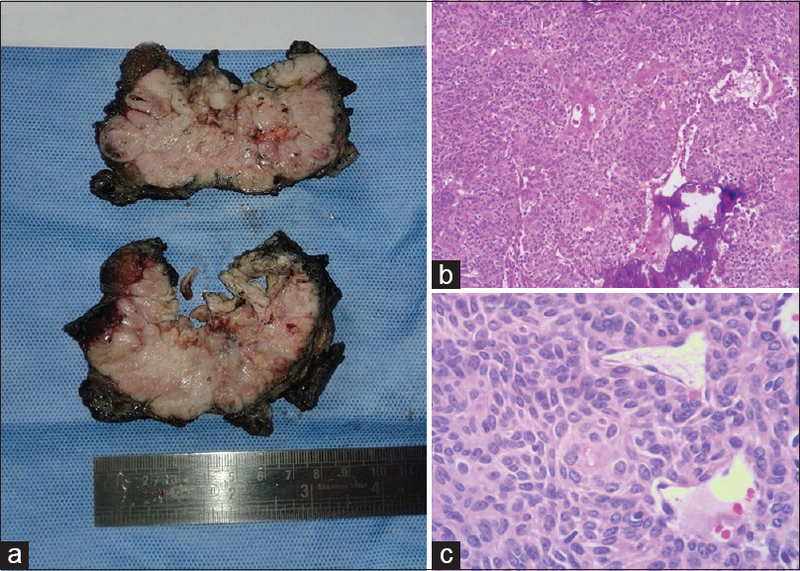 Spindle epithelial tumor with thymus-like differentiation: A case report and comprehensive review of the literature and treatment options. Head Neck 2015;37:746-54.